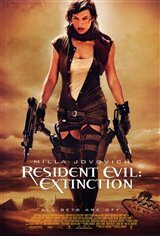 Alice (Milla Jovovich), now in hiding in the Nevada desert, once again joins forces with Carlos Olivera (Oded Fehr) and L.J. (Mike Epps), along with new survivors Claire (Ali Larter), K-Mart (Spencer Locke) and Nurse Betty (Ashanti), to try to eliminate the deadly virus that threatens to make every human being undead... and to seek justice. Since being captured by the Umbrella Corporation, Alice has been subjected to biogenic experimentation and becomes genetically altered, with super-human strength, senses and dexterity. These skills, and more, will be needed if anyone is to remain alive.